Battlestar Galactica is a sci-fi tv series (Dae Jim’s favorite serie) that aired in ABC network from 1978 to 79 and in Sci-Fi network from 2004 to 2009, followed by its prequel, Caprica, aired from 2010 to 2011. The show tells the story about a group of planets called the Twelve Colonies, where human civilizations live, and their war against a cybernetic race known as the Cylons, aiming for the extermination of mankind. And the Australian studio, Black Lab Games puts you in the middle of this conflict in Battlestar Galactica Deadlock, a WEGO strategy game in which you oversee the Colonial Fleet, you’ll protect the colonies, build new fleets, recruit officers and protect the colonies. But enough talking, let’s take a deeper look on what the game offers. Battlestar Galactica Deadlock presents one of the most interesting battle systems I’ve had the opportunity to play. You control your ships by positioning them in a full 3D arena and engaging enemy ships. But be careful about your ships trajectory, since they can collide with other ships! Besides controlling their positioning, you also control their weapons, choosing targets to focus fire or using missiles, for instance, using special weapons or repairing your ship. Who to attack, who to defend and how to do each of theses things is all up to you. Ships have many different health (or durability, to be more precise) gauges, each one corresponding to a different part of the ship. And each one plays a different rule in your ship performance: If your front is destroyed, aiming will be compromised. If your back/propellent gets damaged, your movement will be reduced. You can always repair the damage in one of these parts of the ship, except for the hull. Once its energy is depleted, your ship is destroyed! Remember to position your ship according to protect damaged parts. Out of battles, at the bridge of your ship, you can build and develop new ships (as you progress the campaign) with incomes from the colonies, so to protect them is a must! From there, you can jump your forces to any planet of the quaternary solar system of Cyrannus. But remember your enemy can do the same! Battles are really challenging so you may always be prepared: Position your fleets so you can always protect the twelve colonies to increase your income. The game presents beautiful 3D models rich in detail, although the game has few animations for the ships. The same can be said about the bridge where you administrate your fleet. It’s nice to see the ships taking damage exactly where the explosions hit them. The space, with millions of stars, asteroids and nebulas is great! The replay function is something really interesting. After you accomplish all goals on a mission, you can review your best moments (or biggest fails) In a customizable replay that can be used to make good clips (and can be shared). Or maybe Rafael and Patrick are the only real humans in LifeisXbox’s team and I am a Cylon? Game pace is reaaaaally slow. After you get used to managing your fleet in battle, things get a little faster. Gamers who aren’t familiar with WEGO or turn-based strategy games may find it a little annoying. Keep this in mind before picking a copy of the game. Music and sound effects are no big deal, but characters have good voice acting. And I know sound doesn’t propagate in space, but you can hear all sorts of shootings blasts and explosions, so no need to make jokes about it all right? You can, somehow, administrate the use of energy by your ships changing its posture from defensive to offensive, but except for the thruster’s boost, that increases the range of your movement at the cost of your mobility, I couldn’t see much difference. Needless to say, but this game is aimed for a very specific public, what’s great for them (me included), but will surely divert the attention of many gamers. Damn, LifeisXbox’s editor-in-chief a Cylon? Maybe! Information on you HUD is quite difficult to see. As there are lots of numbers and gauges representing different things, fonts used are too small, making it hard to read (I don’t use glasses nor have any problems with my vision… even sitting less than 2 meters away from my 49” TV). 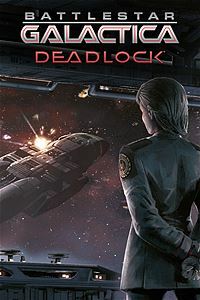 [Score: 7,8/10] Battlestar Galactica Deadlock is a great strategy game that we, fans of the genre, will surely enjoy, be you an enthusiast of the series or not. Its visuals, combat mechanics and fleet management are deep enough do live on its own, keeping players engaged for hours. Driven by developer’s vast experience on the genre, you’ll face a challenging campaign the feels really rewarding after each victory. If you’re into tactical and strategic games, take a look at this little jewel. You aren’t going to regret it. Played on: Xbox One | LifeisXbox received a digital review code, provided by Slitherine Ltd. Previous Article Start writing for LifeisXbox! Searching for a new editor!